The April 2015 Nepal earthquake (also known as the Gorkha/Ghurka earthquake) killed more than 8,800 people and injured more than 23,000. It occurred at 11:56 NST on 25 April, with a magnitude of 8.1, which would get anyone's attention. Hundreds of thousands of people were made homeless with entire villages flattened, across many districts of the country. Geophysicists and other experts had warned for decades that Nepal was vulnerable to a deadly earthquake, particularly because of its geology, urbanization, and architecture. Many Nepalese men found homes and careers in the British Ghurka Regiment. Some of those men are personal friends. Many of those men lost their entire family in the earthquake. Even so, a friend, who I had asked for a three-chirra kukri (Ghurka military knife), managed to send one. I asked for a few blades before the quake and he sent the first. I didn't expect to see it because of the disorder and personal tragedies associated with the earthquake. But Ghurkas are who they are. 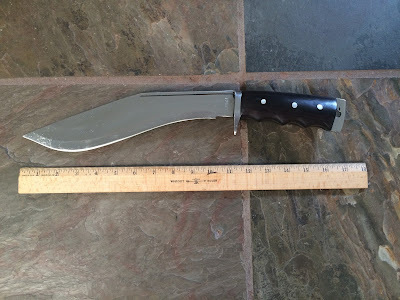 Today I received an e-mail letting me know that in addition to the traditional water buffalo sheath (with the sharpening blade and utility blade) that the knife was shipped with, they're also sending a kydex sheath because they know that Americans prefer them for daily carry. So I'm humbled. I find it amusing -- yes amusing, that the liberal, progressive left, that runs the country and has engaged in a war on the police now finds that murders are up in urban liberal hells (deep blue areas of the nation). (Wall Street Journal) The nation’s two-decades-long crime decline may be over. Gun violence in particular is spiraling upward in cities across America. In Baltimore, the most pressing question every morning is how many people were shot the previous night. Gun violence is up more than 60% compared with this time last year, according to Baltimore police, with 32 shootings over Memorial Day weekend. May has been the most violent month the city has seen in 15 years. There is a depressing tendency for Americans (among others) to forget that there is a very thin blue line that stands between them and the mob. In free America, where people are encouraged to defend themselves and are enabled by the law to do so, the crime rates are low. In areas where the police are supported by the communities that they serve, that partnership results in lower crime rates. When public leaders encourage the lawless to murder that thin blue line, the line retreats and leaves the city to its own devices. No the police are not perfect. They are like (or may be) members of your family, your neighbors, your friends or maybe not. But one thing is for sure. 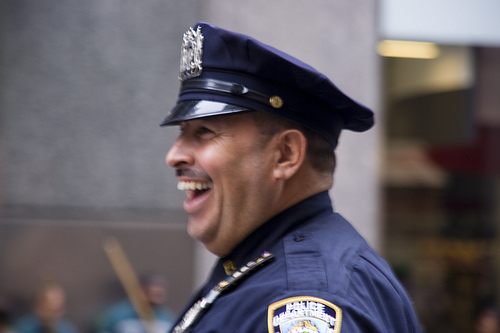 So long as police departments recruit from the human race, the officers who work there will be fallible. The nation's urban hell holes declare war on the police and miraculously, within a very short period of time, the animals in the zoo are empowered and start murdering. It's not a gun problem. It's a crime problem. The areas of the US that encourage private ownership and allow open carry don't have a crime problem. The portions of the nation that support their police don't have a crime problem.